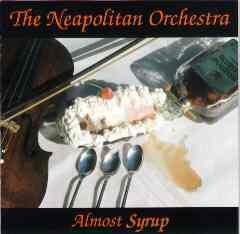 The Neapolitan Orchestra - "Almost Syrup"
Dayton Ohio's Neapolitan Orchestra plays heavy, mostly instrumental power-progressive music. The band consists of Tony Peters on guitar, Ben Burton on drums and keyboards, and Chris Matthews on bass. A review on the bands web page compares them to Pink Floyd, Rush, and Blue Oyster Cult. To my ears the Rush influences are strong, but I also detect elements of Cream, Abbey Road's heavier moments (e.g., She's So Heavy), and good ol 60's/70's jamming. The keyboards are rarely in the forefront, instead playing a background or layering role. The guitar isn't flashy. Rather, the focus is at all times on solid, tastefully developed melodies. The disc opens with two 3-4 minute tracks. "Bwa Kwa Da Da" is an easy going, guitar dominated rockin' tune, and "On A Different Plan" has a somewhat bluesy, Cream-like feel to it. "Everything's Here...But You" is a bluesy number and the only track with vocals. Though I think the band is strongest at instrumentals, the vocals on this tune are really soulful and fit the song well. And at eight minutes the musicians have plenty of opportunity to stretch out. "Embryonic Stages" is one of my favorites. A real rockin' tune, it starts with some wailing acid-like guitar and then goes on to numerous tempo and theme changes in its six minute length. "Reality Of A Dream" is similar with great guitar work and the most up-front bass tune on the disc. The last two songs, "Mental Discovery" and "Looking Through Two Windows" are the longest (12 and 9 minutes) and most Rush-like numbers. Its challenging for a primarily guitar, bass, percussion trio to keep instrumental music exciting and Neapolitan Orchestra does a great job. The band takes its time developing themes and there is always a great jamming feel to the music. If you enjoy heavy music that cares more about melody than flash than you will certainly like this disc. You can visit The Neopolitan Orchestra at their web site.